Maslow’s Hierarchy of Needs both criticized and overused in project management. Does it even work? If not, what the hell is going on with my project team? Nothing works to motivate them! If you do not have a background in psychology, you do not need to dive too deep into it. There is no reason to read Maslow’s papers back from 1943. With an adequate allowance, I will tell you about the practical application of Maslow’s Hierarchy of Needs. Even if it is not 100% accurate interpretation, it will be sufficient to improve your motivation efforts. 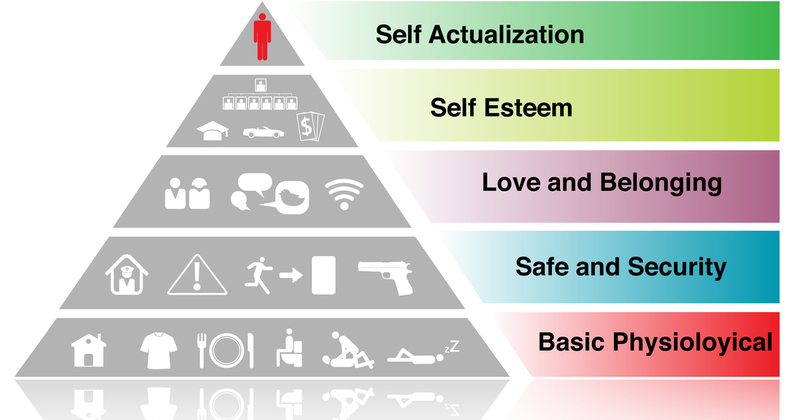 Abraham Maslow theory describes the pattern of human motivation development. It incorporates and is aligned with many other theories of human psychological development. Nowadays, the theory is represented as a pyramid. For sure you have already seen it many times. However, what does it mean? In other words, approaches and techniques from higher levels will not be efficient when lower levels are compromised. The lowest level of needs are the physical requirements for survival. These include air, water, and food. Anything that our body need to operate. Yeah, it sounds like you can skip it. Unless you work in an environment with severe poverty or some disaster areas, it is insignificant. Modern cities and offices have morphed the physiological needs. Take a look around. Water cooler, cakes, coffee and tea, toilet. It is there, and you take it for granted. However, the next time the toilet is out of order or a water delivery delays, do check the amount of rumbling in the office. Even if people take it stoically, I do not recommend planning any team building activities. Most of your efforts will be wasted. Better focus on overcoming these small inconveniences. Once you are relatively fed and warm the safety kicks in. People start looking for a safe and secure shelter to sleep and live. However, again, for most of us, this need had transformed from physical to financial safety. While we have money, we can pay for food, rent, insurance and able to fulfill other needs. Take away money and other social securities. Next, your mind draws a disturbing picture where you need to hunt for your food. Threats related with firing a person never motivate. Moreover, when you try to penalize a person it also has little positive effect. When you deprive your employee of financial stability, the reaction is to regain it. However, due to our negative bias, we do not tend to eliminate the threat and fix problems. It is too risky. We tend to substitute the income source by finding a new job. Important to note that nowadays financial stability is tightly related to the Physiological Needs. So, when you endanger safety needs, you make a hit on the lower level as well. When first two needs are met, people want to socialize. Your team members will want to make friends, connect with colleagues, and create families. It will happen with or without your participation. However, I do suggest to influence this process actively. By creating a friendly and open environment. Encourage professional interactions without your participation. Let people network beyond project team. Always help newcomers to adapt. However, be aware that you may impede this processes. Blaming and competitive environment that gets out of control will make it hard to socialize. Moreover, do you know this saying? It is related to the dysfunction on this level. At some point, people want to feel respected and valued. They want accomplishments. Explain the value and importance of any task that you give. Mandate tasks kill self-esteem quickly. Say thank you often. Daily. Encourage people to talk about their hobbies and passions. That alone makes them proud. Never criticize or judge these activities. Recognize the impact of every team member. Though be careful, not everyone feels comfortable hearing public praises. Help people to set and achieve goals. The process of moving towards a challenging goal boost self-esteem better than anything. By the way, project team development is one of the responsibilities of a project manager. Then, people will want to match their self-esteem with the significant achievements. They will want to achieve what they worth. Quite often it transforms into a need to help others or to follow some greater goal or dream. Can you be of use at this level? Lots of team members will not know what they want. Until they understand how to realize their potential, you can help them. Have you ever participated in some weird team building activities organized by HR department? When you need to do something strange for the higher purpose? Handcrafting or drawing something for charity, homeless or global environment. When you look around, you see that how of the team looks out of place. They do not understand what the heck is going on. It is just an example of motivation efforts for people on the wrong level. The outcome of such misused activities will be harmful. Never rush to the higher level. The path to the self-actualization is long. Moreover, different people will get there in different time. Be patient. Learn how creating Work Breakdown Structure helps to motivate your project team.